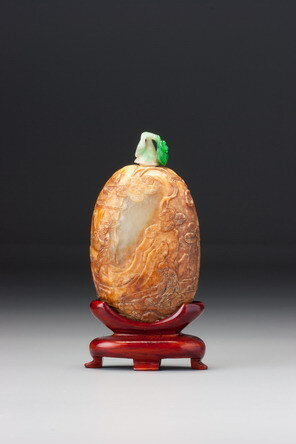 The material here represents the highest standard of purity of white material aspired to by Suzhou carvers of the first phase of snuff-bottle carving It comes as close to pure white when set against a piece of white paper as it seems possible to achieve in nephrite, which always has some slight hint of colour. The carving is typically understated for first-phase Suzhou wares, with masterly control applied to very low relief carving set against a perfectly flat and beautifully finished ground plane. Kleiner commented that a certain stiffness in the carving suggested a nineteenth-century date for this bottle (Kleiner 1987, p. 45), but we perceive no such stiffness. On the contrary, the carving seems entirely fluent and superbly controlled. 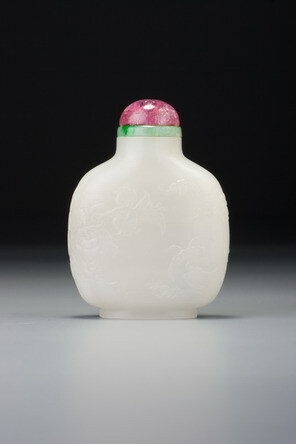 The carving style, material and quality of this bottle would allow an early Qing date, but the use of simple incised lines in conjunction with more fully rounded carving in the clouds is related to a phenomenon found on classic Suzhou bottles of the mid-Qing period almost certainly continuing into the first half of the nineteenth century, so perhaps this is an anticipation of that style. If so, this probably dates from the Qianlong era and represents a continuation of the first-phase style concurrent with the fully developed classic wares for the snuff-bottle world which were certainly being produced by the second half of the Qianlong era.